Editor’s Note: Jim Hummel’s quarterly roundup provides new information and developments on previous Hummel Report investigations. 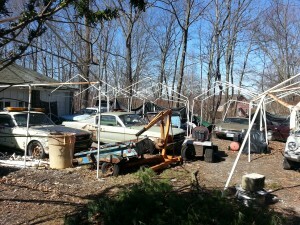 One Man’s Junk: Last fall we told you about Lorraine LeClerc’s decades-long struggle to get dozen of junked cars cleared from her neighbor, Al Gaffney’s, property. In some cases the cars were just feet from her yard. The case has gone from City Hall to Superior Court and back, with no end in sight. While Gaffney has cleared some of the cars, 21 remain by the city’s count. The remaining vehicles are registered and insured, which satisfies the state, but if they are inoperable that would violate a city ordinance. City Solicitor Mike Marcello is preparing to bring a case against Gaffney, but said he needs several months to see if the term “inoperable” applies to Gaffney’s cars. A zoning hearing is scheduled for July. Bridge to Nowhere? : In 2011 we questioned why millions of taxpayers’ dollars were used to build what some called a Bridge to Nowhere within the Quonset Business Park. Now a study says that bridge has, in fact, helped with the development to Quonset. The bridge, which cost $4.2 million and was funded mostly by the federal government, connects one side of the park to another. But some business owners at the time told us drivers could access other roads to accomplish the same goal, so why build the bridge? A report issued last fall says the bridge and resulting safety improvements leveraged an estimated $64 million in private investment and 504 new jobs. 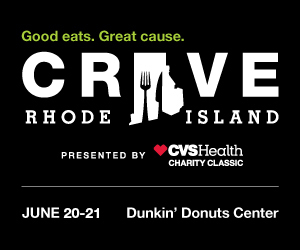 Of course Quonset has continued to be one of Rhode Island’s bright spots in terms of economic development, aided in part by the Route 403 connector road leading into the park. Welcome to Providence and Watch Your Step: One of our first Hummel Report investigations in 2009 focused on the deplorable conditions outside the Amtrak station in Providence. Now, millions of dollars and seven years later, much-needed improvements are almost complete. For years cracked sidewalk, broken streetlights and rutted concrete greeted riders at the Amtrak station, often the first thing visitors using the train to Providence would see when they arrived in the city. After years of arguing over who would pay for proposed improvements, the Rhode Island DOT, using more than $5 million in federal money, has largely completed an estimated $10 million facelift, on time and under budget. 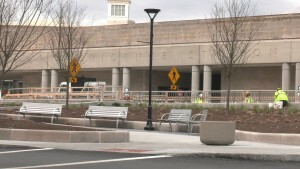 The improvements include reinforcing the roof of the underground parking garage, building a new plaza where buses can drop off and pick up passengers, and adding landscaping and benches. Finishing touches should be completed later this spring. Bringing in Reinforcements: Our ongoing story on a metals recycling company polluting the Providence River included a plea by environmental officials for the government to provide more resources to crack down on violators. And now it looks like help might be on the way. Rhode Island Recycled Metals’ chronic — and blatant — violations of environmental laws pointed to a need for more bite behind the bark of agencies like The Department of Environmental Management, according to Save the Bay Executive Director Jonathan Stone. It wasn’t until the Rhode Island Attorney General’s office stepped in and sued Rhode Island Recycled Metals that the company started to really pay attention, prompting Stone to urge the administration to give state agencies more resources. In her budget, Governor Raimondo proposed the addition of two enforcement staff at DEM, including an attorney in the legal office and an inspector in the office of compliance and inspection. That, Stone said, would be a start toward restoring the agency to the enforcement staffing levels it had a decade ago. The general assembly still has to pass the budget. The Fix Is In: It’s been nearly three years since the state put up Jersey Barriers to protect defective guardrails along each side of the Iway bridge. Now we’ve found out those guardrails should be fixed by the end of the year. Since 2013 the ugly barriers have been a reminder of a defect in the decade-old state-of-the-art bridge. 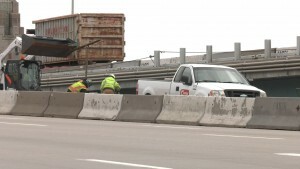 Inspectors found that the guardrails were not installed properly and for safety reasons put up the Jersey barriers while the state and contractor, Cardi Corporation, haggled about what needed to be done to fix them and who should pick up the cost. The DOT tells The Hummel Report work should be completed — in four separate phases — by November 1 and that the contractor is picking up the cost of the repairs.